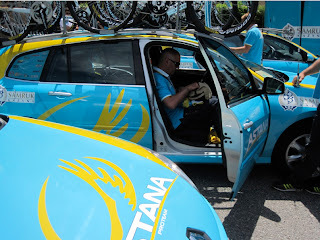 As a fan I go to see the riders compete, but there is much more to see at a big pro tour than just a pretty face and a fast pair of shaved legs. 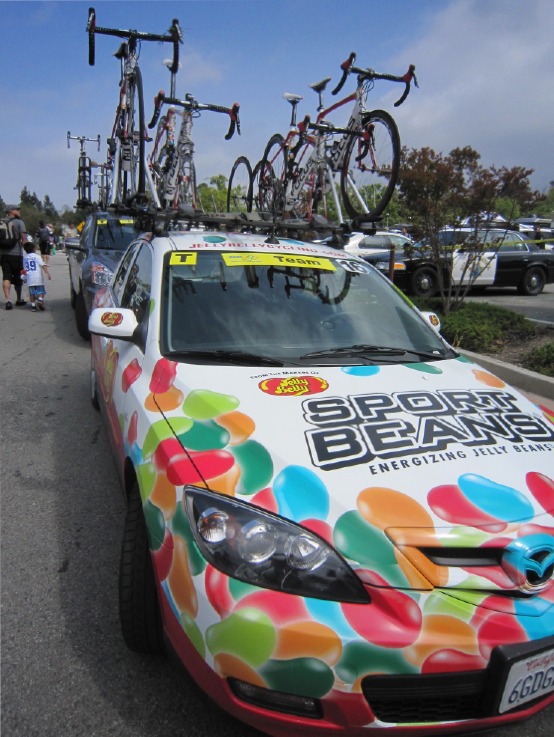 There are bikes, and there are some very colorful useful cars. 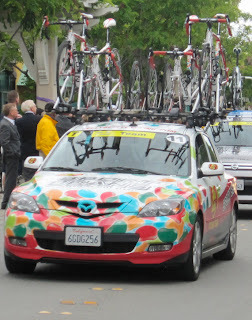 Perhaps you have thought at some point, just as I have, "my car is so boring, I need a paint job like that." 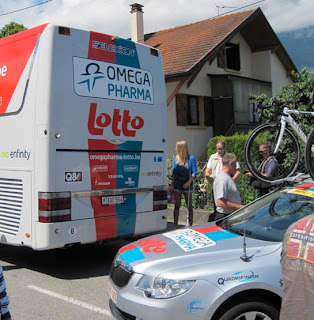 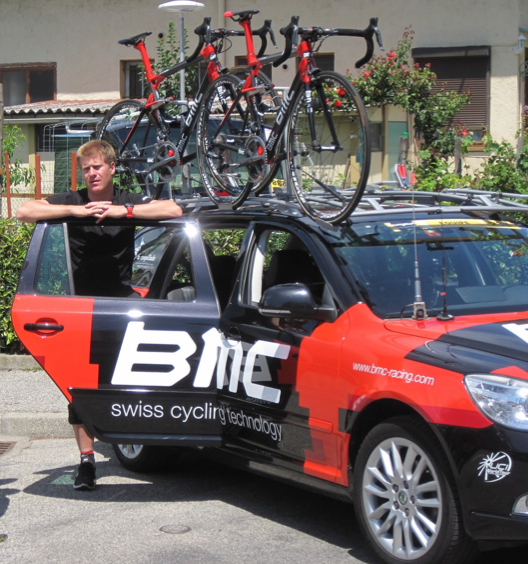 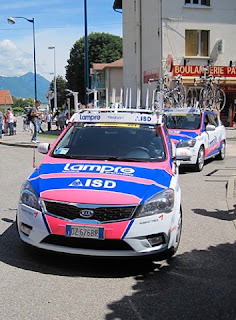 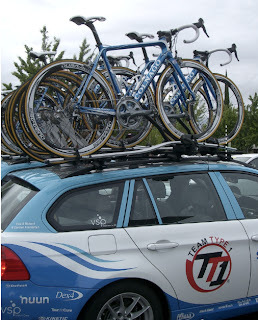 Let's go on down the road with a pictorial journey of the varied graphic designs of the professional cycling team cars. 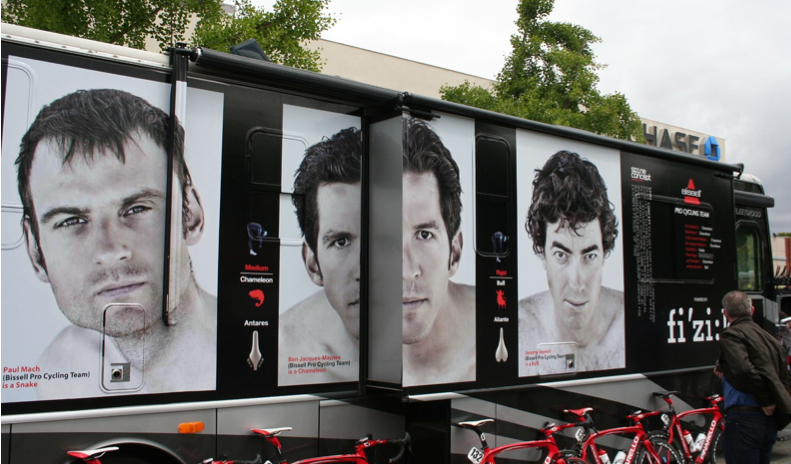 Which one would you chose? 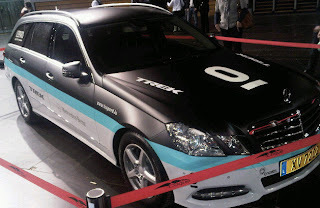 I want more than one. 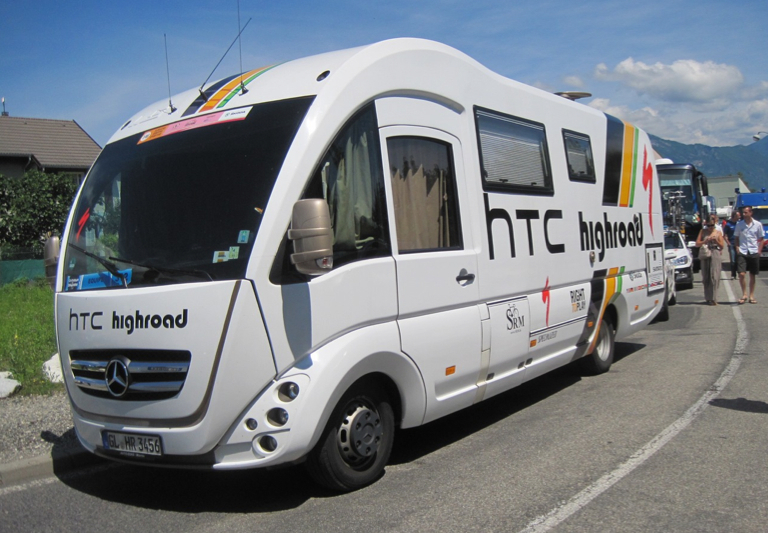 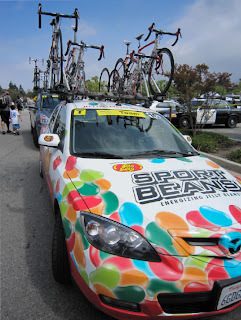 I'd like a car covered with jelly beans for Monday morning and a Leopard Trek sleek design for Friday night, and a HTC mini bus for weekend warrior extravaganzas. 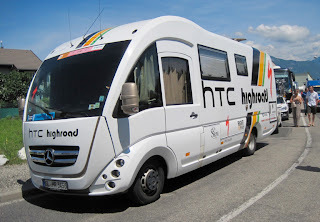 I don't need, nor do I want, that broom wagon anywhere near me. 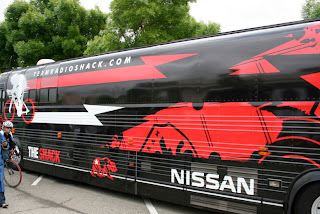 I'd like to experience what it would be like to hang onto the backend of a moto (motorcycle) during a race. 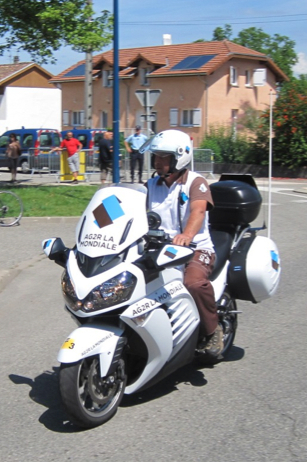 However I would not want to be one of those mechanics who carry a team bike over their shoulder for hours while on the back of a support moto going up a small winding mountain pass in Italy. 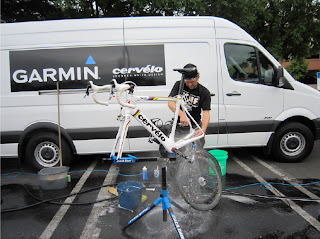 I would enjoy being on the other end of a sticky bidon with Tom Boonen holding on tight. 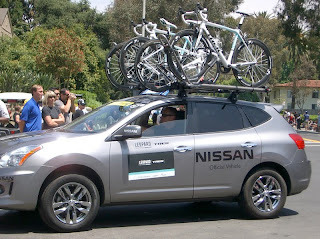 I'm not certain I would pay $2000 to ride in a VIP car during a Tour, unless I won it in a contest. If I were inside a team car, racing down the street through throngs of people, I'm not certain I could refrain from being the worst kind of backseat driver. "Ooh watch out for that ... whoa, was that a cow or a fan ... brake into the corner, accelerate out of the corner ... whoa, I guess that works too ... can you keep two hands on the steering wheel please ... do you have to talk on that radio all the time ... 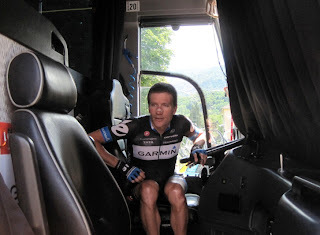 I have to pee." 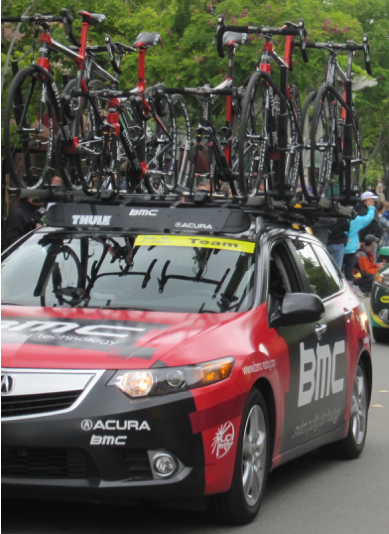 I love taking pictures of everything I see at a race, I have to share these pictures somehow, they are so cool. 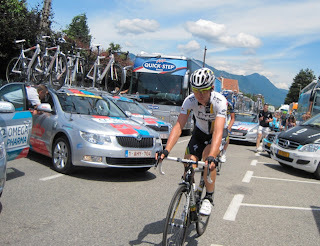 All photos from 2011 and by PedalDancer.com, Kenny Rakestraw, and SyS in France (we get around as a family!). The vehicles used by a ProTeam vary depending on which country they are racing in. 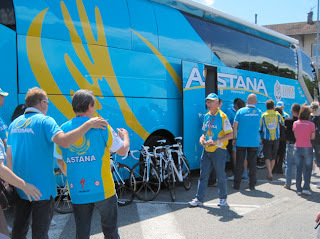 Arranging the cars, buses, trucks and vans used by a team is part of the job of team logistics. 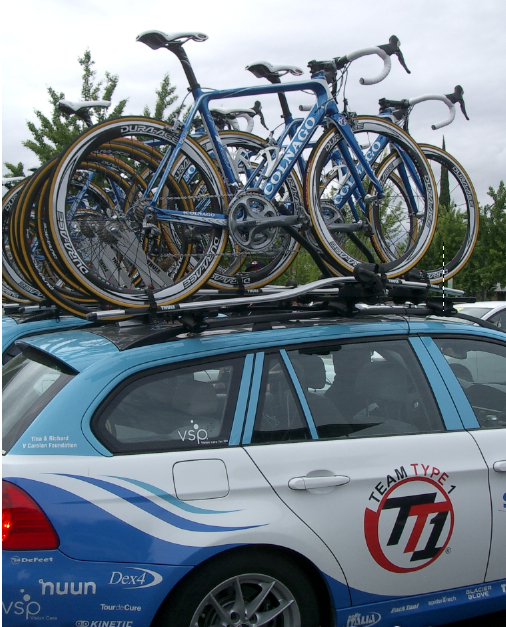 The make, model, size, number, and whether the vehicle is owned or rented by the team all vary depending on the location and the race. 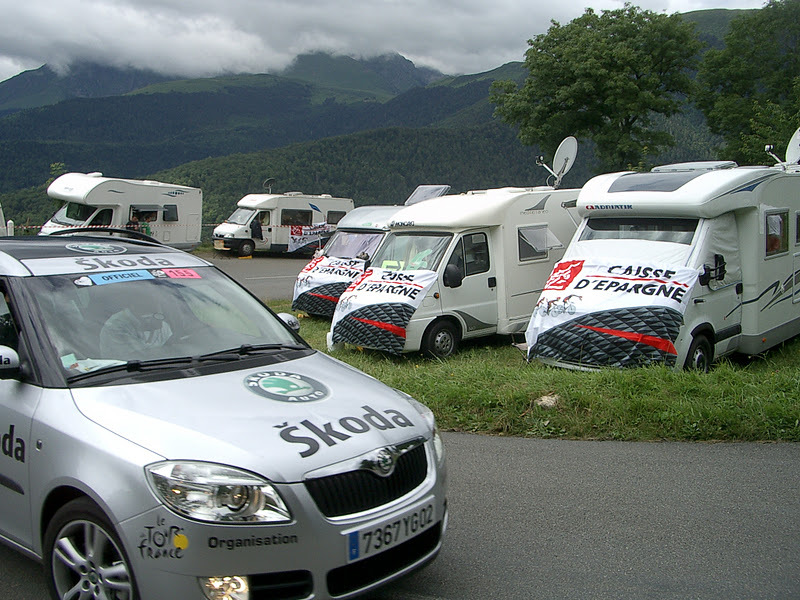 Some team vehicles are stored in Europe or America and driven the distance to the race. Often the trucks, buses, vans and cars are rented or leased for the period of time needed. 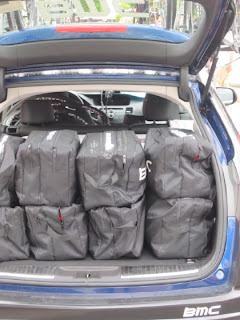 This explains why the team car models vary in the USA compared to models used in Europe. Obviously the team budget is sometimes reflected in the size of the bus. 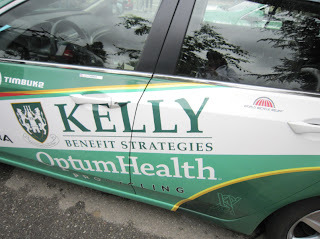 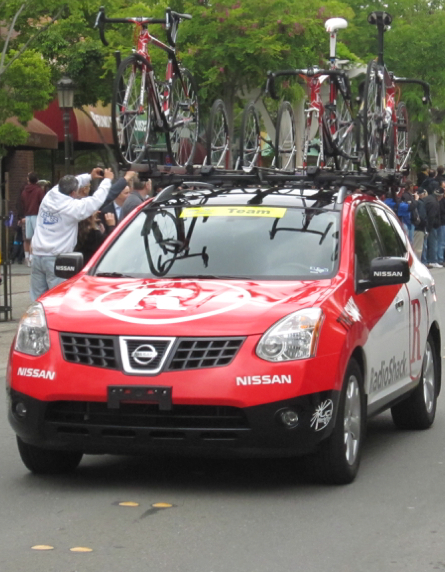 If a Tour or race has a car manufacturer as a sponsor, the race sponsor might override the team sponsored car manufacturer. 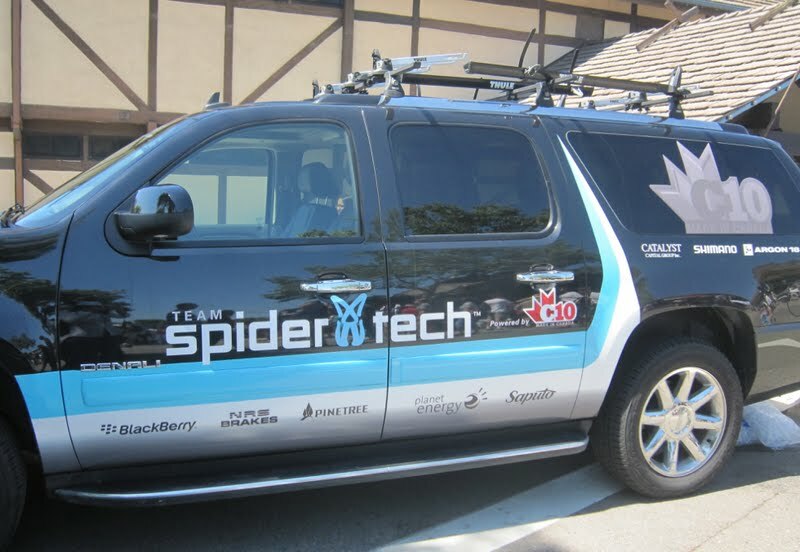 This is the reason why Leopard Trek placed a simple decal on their Nissan vehicles used for the Amgen Tour of California, because Nissan sponsored the race, but there real team sponsor is Mercedes. 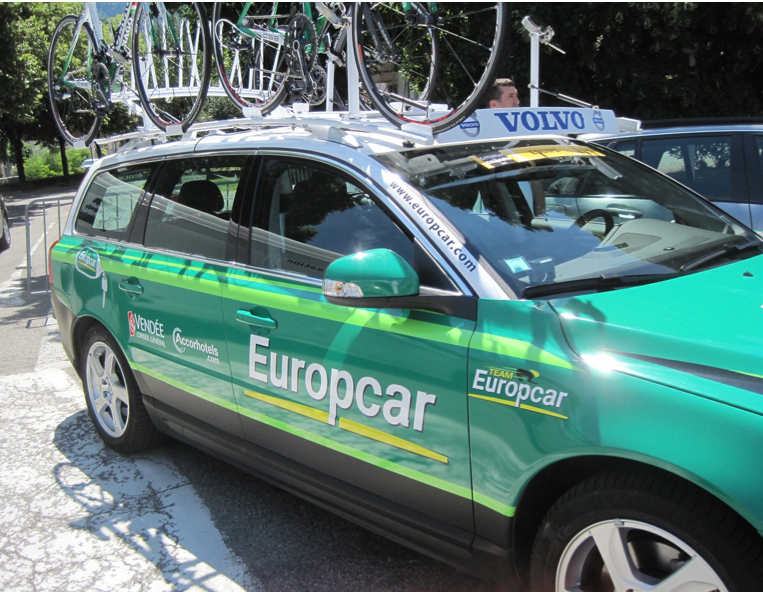 Mercedes are used as team cars by Leopard Trek for the European races. 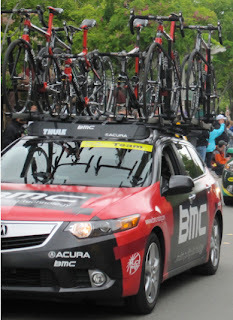 Although BMC drove their team sponsored Acura cars in California but not in Europe. 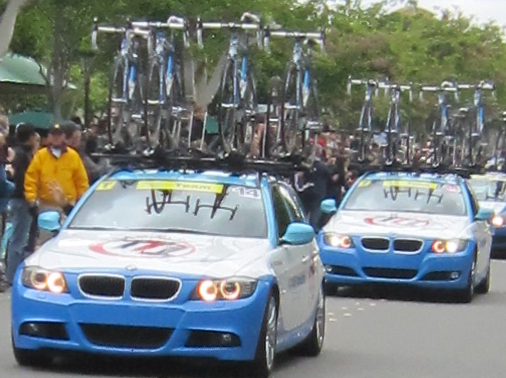 Because the cars are often rented from a city close to the race start, the license plates give away the secret. 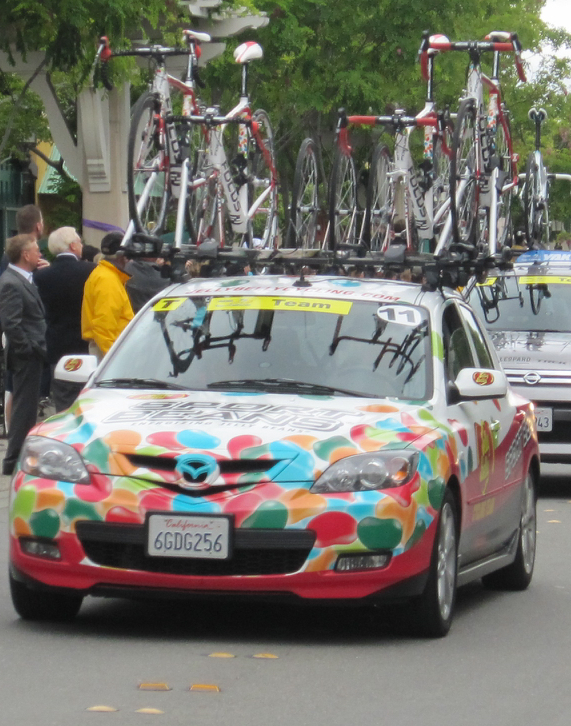 For the Tour of California many of the vehicle license plates were from Nevada. 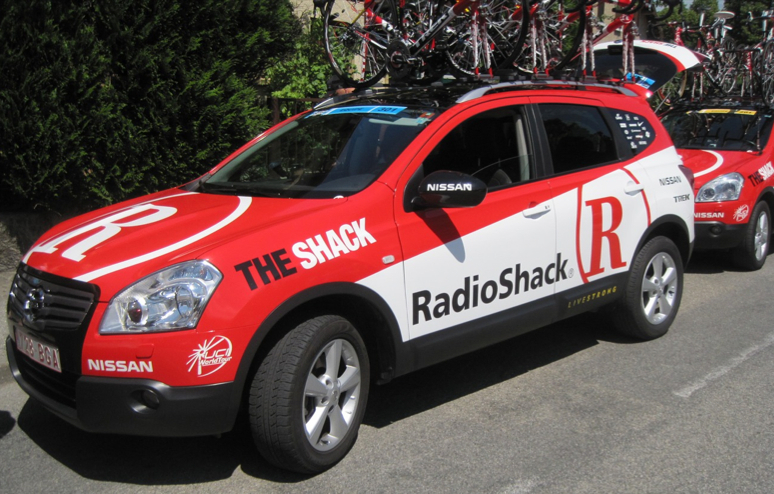 The rented vehicles used by the team and race organizers will have team graphic decals added by local automobile graphic companies. 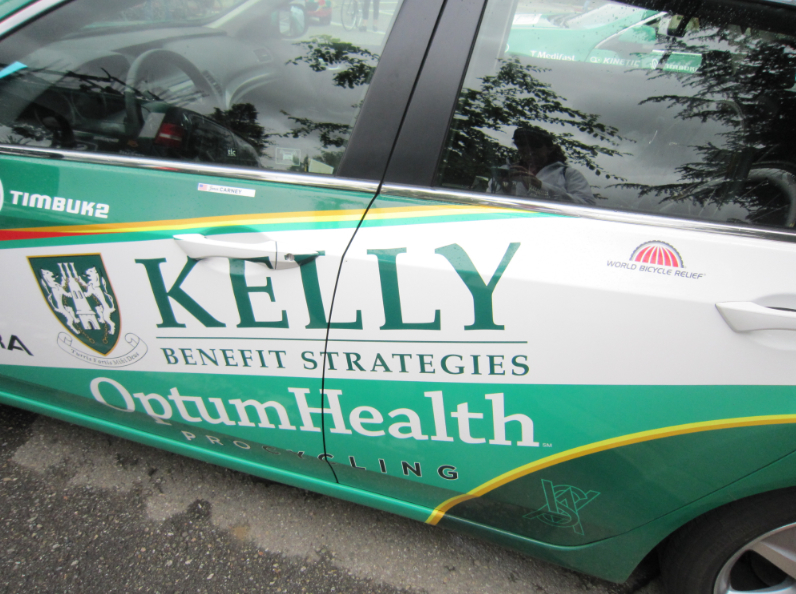 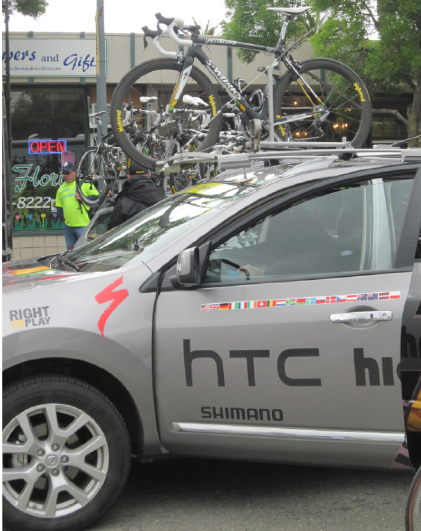 For example Summit Graphics in Commerce City, Colorado is doing some of the official car graphics for the USA Pro Cycling Challenge. 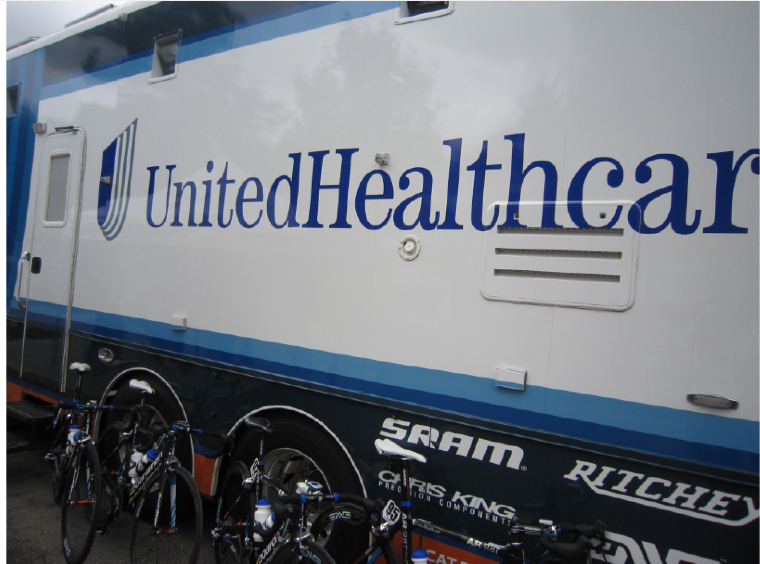 These companies employ graphic designers who work with the race or team logos to achieve a consistent brand look. 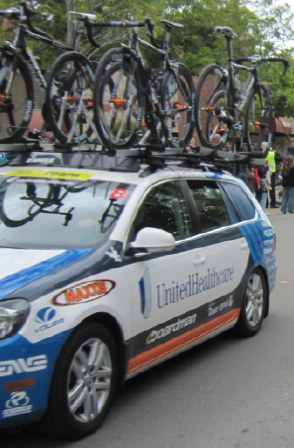 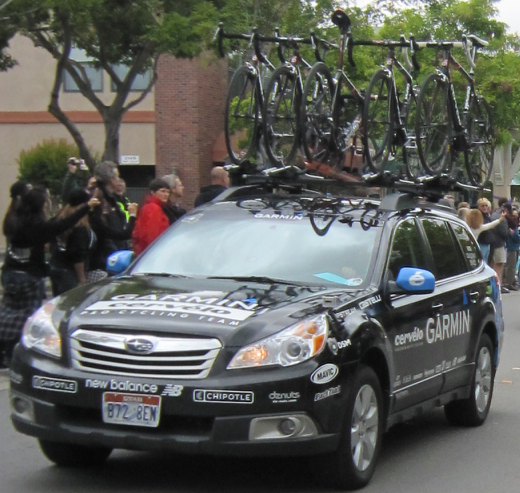 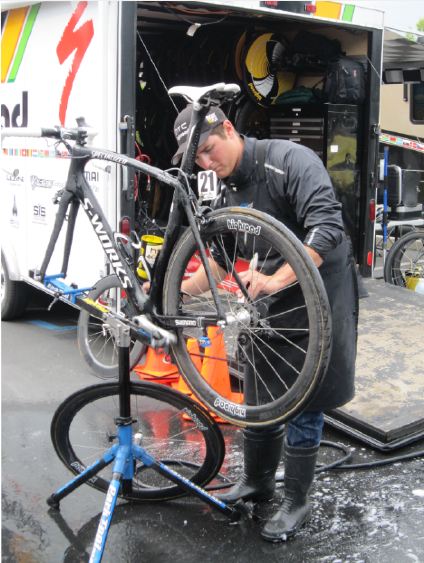 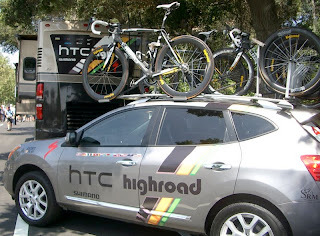 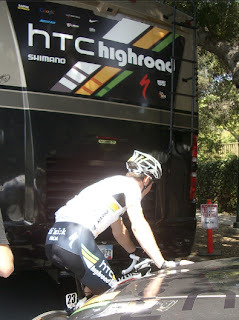 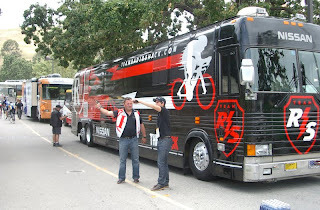 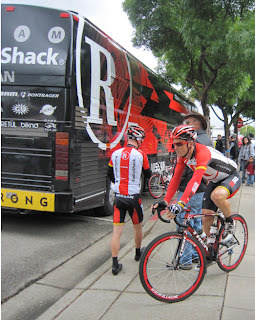 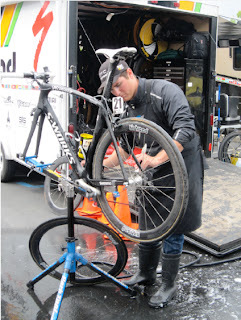 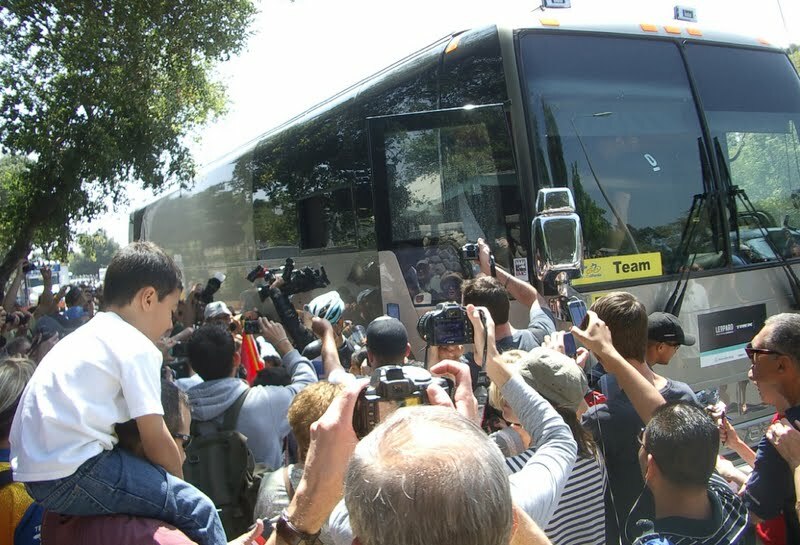 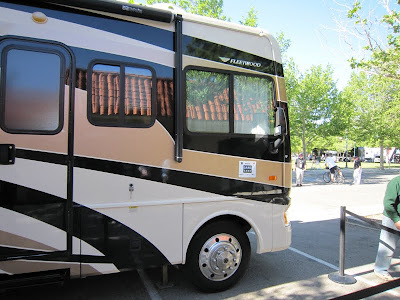 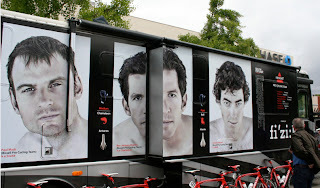 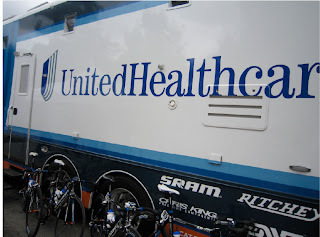 Sometimes the team must keep it simple, as this Saxo-Bank team bus did at the 2010 Tour of California. 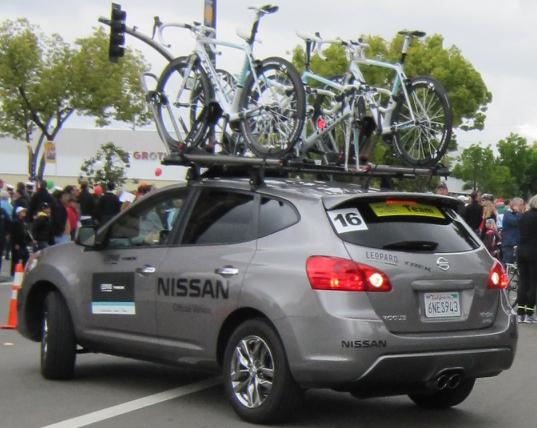 Ask Nick: Caravan ordering - what determines the order the team cars are in when following the peloton. Ask Nick: Calling Car 1, come in Car 1 - Since there are two chase cars, what’s the difference between Car 1 and Car 2? 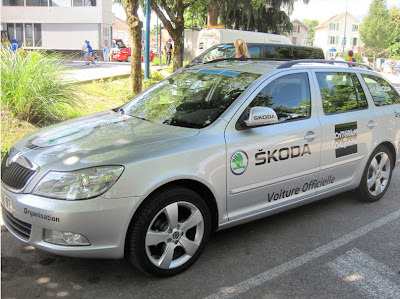 The Skoda wagon - is it the best team car for a mechanic? Who is ŝkoda?